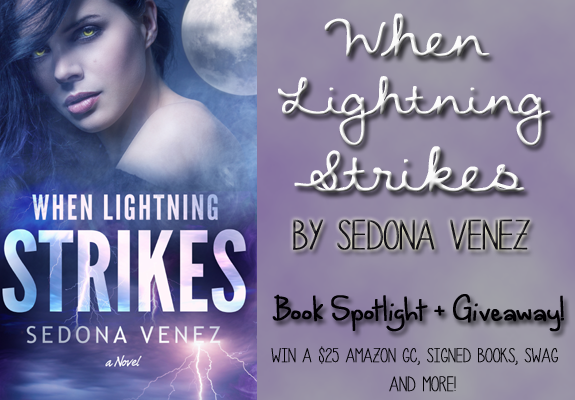 Bittersweet Enchantment: Book Spotlight: When Lightning Strikes by Sedona Venez + EPIC Giveaway: win $25 Amazon GC, Signed Books, Signed Swag & More! 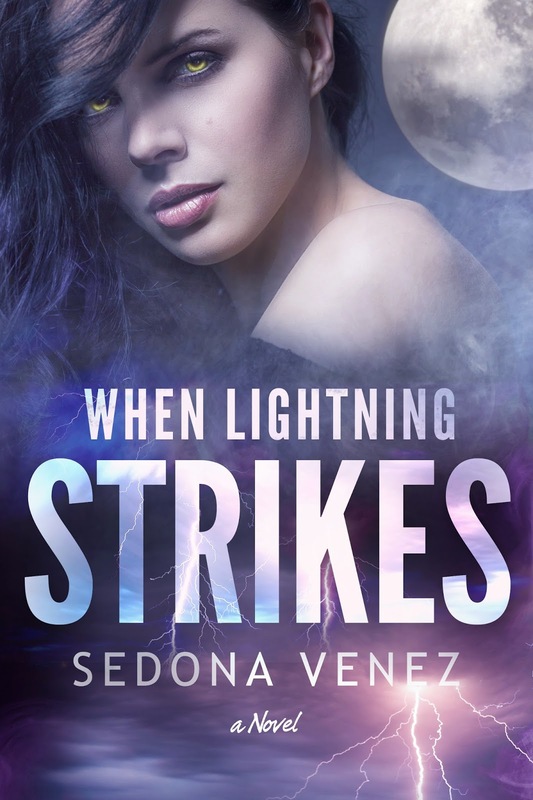 Book Spotlight: When Lightning Strikes by Sedona Venez + EPIC Giveaway: win $25 Amazon GC, Signed Books, Signed Swag & More! Today I have a really special treat for everyone. 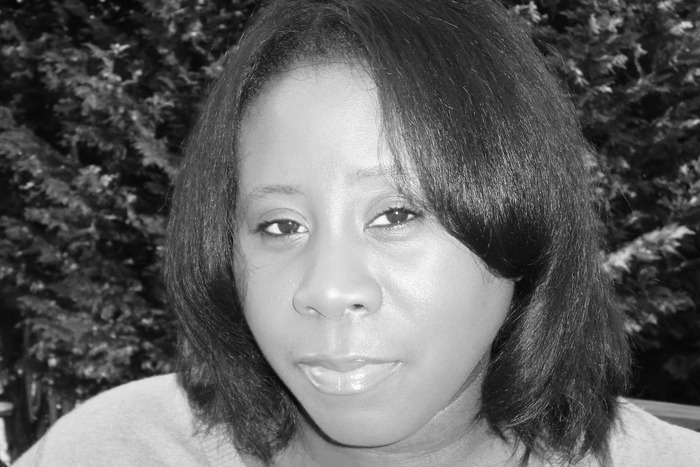 Once again I have the pleasure of working with Author Sedona Venez on my blog. A few weeks ago she emailed me and ask me to spotlight her new book, WHEN LIGHTNING STRIKES and of course will be hosting an EPIC giveaway! There are so many sweet prizes she is giving away so be sure to enter the giveaway below for a chance to win! Ryker Alfero - Wolf-Shifter. Tattooed. Dangerous. Off-limits. Everything I crave — and everything I shouldn’t want. In a blink of an eye, before I realized what I was doing, I walked over to him, straddling him and cupping his face. I didn’t move. Instead, I ran a finger across the scar on his left eyebrow. Strangely, he leaned his face into my hands tenderly, wrapping his arms around my back. I tried not to blink in shock. Dammit, he was turning out to be exactly the opposite of what I envisioned. Despite his hard, steel demeanor, I felt the passionate streak that ran through his core. He actually cared about his pack and Others. This wasn’t what I envisioned him to be as an Alpha from a ruthless bloodline. I ran my fingers across his well-groomed, dark beard, enjoying the softness. He growled low and sensually. I felt the slight prick of his claws through my shirt, which normally would have sent me sprinting away, but there wasn’t anything normal about this strange connection between us. Slowly, I felt his claws retract and his blunt fingers caress my back. His full focus was on me, the attention giving me little shivers of awareness as we stared at each other, speechless, faces mere inches apart. Ryker leaned into my body, pressing his lips against mine before he sucked my tongue into his mouth. My tongue slid around the tip of his, then rubbed under it. My body pulsed with need, and every cell was focused on him. His hands slid up to my neck, grabbing the back of my head possessively before kissing my throat gently. The contradiction between the hardness of his grip on my hair and the gentleness of his kiss sent a shiver down my spine, my mind imagining all of the other delicious things his mouth could do. What would those big hands feel like on my body? My skin quivered at the thought. Thank you all for stopping by! Here are the details for the giveaway. GOOD LUCK! There will be a total of 3 winners. Sedona, I can safely say one thing about this...RAWR! This sounds like a great book! I really want to read it. Thanks for the giveaway!